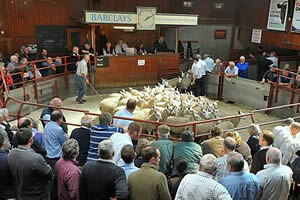 The Cumberland & Dumfriesshire Farmers Mart had forward 8,874 Store Lambs (including 2,343 Hill Cheviots) at their Weekly Sale at Longtown on Tuesday 1st November, 2011. Another large show, all classes met a dearer trade with many buyers present. Top of £77.50 and £75.50 for Texels from Greenknowe, others £75 Park, £71 Blakelaw; Suffolk cross £71.50 Nettling Flatt; Beltex £71 Pallet Hill; Charollais £70.50 Lustruther; Lleyn £68 Height; Dorset £67.50 Whitedyke; Blackface £65.50 Crookburn and Longsyke, £64.50 Yatesfield, £62.50 Lamperts, £61 Horseholme; Greyface £65.50 Yatesfield, £64.50 Derwent House, £64 Lowthwaite, £63 Bayldon and Hightown; North Country Cheviot £65 East Murton, £64.50 Bradley; Cheviot Mule £60.50 Powisholm; Zwartbles £55 Cacrabank Cottage; Swaledale £48.50 Lilswood Cottage, £44.50 Sheepriggs, £45.50 Derwent House; Herdwick £40 Nettling Flatt. Cast ewes £73 for Blackfaces from Crookburn. Cast rams to £130 for North Country Cheviots from Bayles. Hill Cheviots were another huge show, top draws still very dear. Top of £64.50 from Arkleton, others £60 Cossar Hill and Carlenrigg, £59.50 Girnwood.